When I lived there during much of the 1970’s, Boston was not known for its culinary prowess. It was way before Todd English or Barbara Lynch appeared on the scene. The plain, or rather bland, New England cooking tradition offered little stimulation for my Asian palate that’s used to a spicy array of flavors. I couldn’t quite adjust to the pure taste of the food. 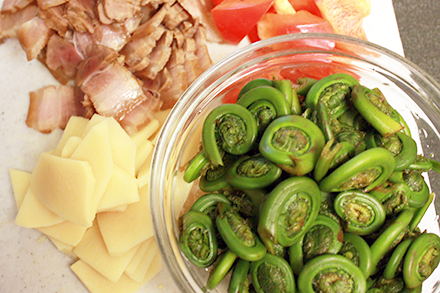 That is until I discovered the fiddlehead fern, a native delicacy. 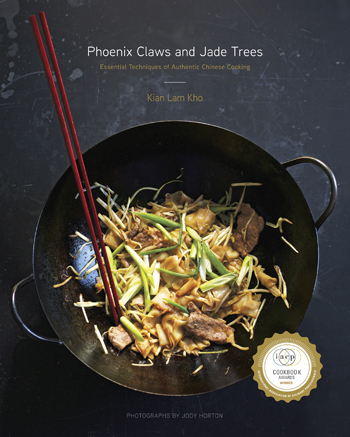 It completely changed my view of the New England cooking approach. It is not about creating flavors for the sake of flavors, but rather to maximize the flavor of what’s already in nature. I finally understood the basic values of eating simply from the land, creating delicious yet sustainable comestibles by using local products in season. The brevity of the fiddlehead fern season epitomizes this philosophy of enjoying seasonal bounties. 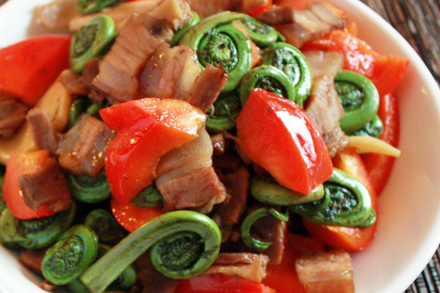 The fiddlehead fern does not need anything other than some basic seasonings to bring out the flavors. From April through May these nutty and slightly bitter greens are available in many green markets, and occasionally supermarkets, throughout the Northeast and Canada. They are supplied by enterprising natives who forage along riverbanks of the region for these young tender shoots of the ostrich ferns. The shoots are curled into a spiral that resemble fiddleheads hence the name. Traditionally New Englanders simply boil them until tender and serve them hot covered in butter with salt and pepper, or cold accompanied by mayonnaise or vinaigrette. Today many chefs, and home cooks alike, are developing modern and sophisticated preparations elevating them to fine food. Asians are not unfamiliar with ferns as vegetables. Young shoots of the bracken ferns are common throughout East Asia. In China they are known as juecai (蕨菜) or fern greens. They are available as fresh greens during the spring and summer, or as dried vegetables throughout the year. Plain stir-fry of fern greens with garlic is a great supplement to other meat dishes, while stir-fried fern greens with meat can serve as a major component of a full meal. Dried fern greens on the other hand are generally used when braising pork or chicken. 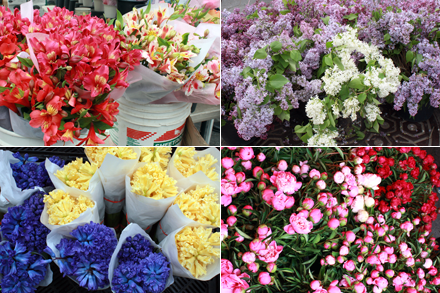 Last Saturday I went to the Union Square Greenmarket where spring flowers such as sweet pea, hyacinth, tulips, iris and lilac adorned every corner. Among the blossoms I found fiddlehead ferns and ramps (another delicious spring foraged vegetable). But I succumbed to the fiddlehead ferns’ seduction and bought a couple handfuls. Armed with my market purchase I returned home to create a stir-fry for the fiddlehead ferns. To better compliment the asparagus-like flavor of the fiddlehead ferns I paired them with the Chinese bacon I made a few months ago. Sweet red pepper and bamboo shoots added color and texture to the dish. I used the dry wok stir-fry technique and created a recipe that I think perfectly showcases this spring vegetable. 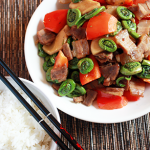 It may not be a plain tasting Yankee side dish but this recipe of stir-fried fiddlehead ferns with Chinese bacon espouses the same basic philosophy: seasonal foods simply cooked with minimum processing. Remove the brown scale from the fiddlehead ferns, trim the stem and wash thoroughly. Bring four cups of water to a boil in a three quarts stockpot. Put the fiddlehead ferns in the pot and simmer for about eight minutes. Drain well and set aside. Cook the Chinese bacon in about six cups of boiling water for about ten minutes. Drain and let cool. Cut the bacon crosswise into thin slices of about 1/16 inch thick. Set aside. Cut the red pepper into one-inch square pieces and the bamboo shoots into 1/16 inch thick slices. Set both aside. Heat the wok until hot and swirl the vegetable oil in it. Heat the oil until just about at the smoking point then add the sliced garlic. Stir-fry for about 30 seconds then add the bacon slices and stir-fry for about one minute. 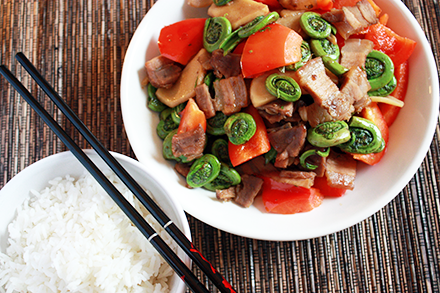 Add the par-boiled fiddlehead ferns, bamboo shoots, red pepper and cooking wine to the wok. Stir-fry for about one minute. Add soy sauce, sugar, and ground white pepper. Stir-fry for another 30 seconds then plate and serve. Fiddleheads are popular in my hometown (Vancouver). They are odd-looking things, but add a wonderful flavor and texture to dishes. My favorite is to eat them pickled. I am really looking forward to trying your recipe. Indu & Frank, These fiddlehead ferns are quite delicious. Try them if you can find them. They are also available in the west coast harvested from the Oregon mountains. I love fiddleheads…the color, the shape, the flavor, the crunch, and they’re wild! This recipe looks great. I don’t have bacon in the house but maybe I’ll try a variation on your stir-fry theme. Good idea! Mindy, Try this stir-fry with sliced chicken, turkey or pork tenderloin. They should all work well with this recipe. I always encourage people to be creative. Just follow the basic technique and you will be successful. I love these ferns. Your recipe with the Chinese bacon looks very good. I will try a variation. Some time ago I heard it was healthier to boil the ferns a couple of times, draining each time. Any knowledge about this? Ostrich Ferns can be purchased at most Nurseries. I have them planted and use them right at the back of my house. I suppose this is sort of cheating, but I’m OK with that. They are beautiful as mature plants! The Latin name for them is: Matteuccia struthiopteris. My first encounter with this wonderful blog. Good job! 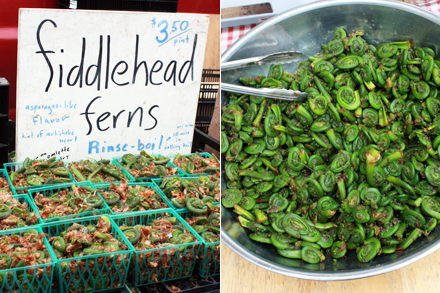 Up here in New Brunswick, Canada, the fiddlehead is our provincial veg. There are many ways the (non-Chinese) Canadians enjoy them and the most common cooking method is the very pedestrian “boiling until dead” style . But, I being Chinese prefer other ways – in simple chow (stir fry) with any kind of meat and oyster sauce, or my favourite, beef and fiddleheads with black beans and garlic. In other words treat it as any other firm bright green veg…asparagus, bitter melon, green beans, green peppers, etc. Note: because of where they’re gathered (marshy, muddy, wet shores in the spring) ALWAYS cook fiddleheads thoroughly. A two minute rolling boil blanching or equivalent, is the way to go. Back door trots is NOT an athletic event to be enjoyed.